After 2 consecutive wins, Irina Mikitenko of Germany is the favourite lady amid the press. After 11 miles two favourites are already missing. Her dream of a third London win in a row is over. 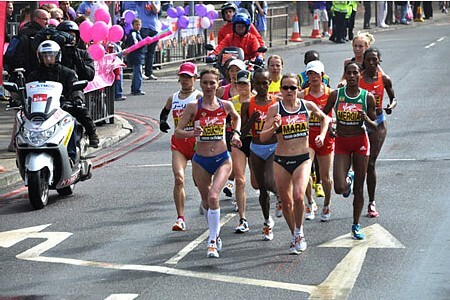 Irina Mikitenko had to quit after 11 miles due to foot problems. 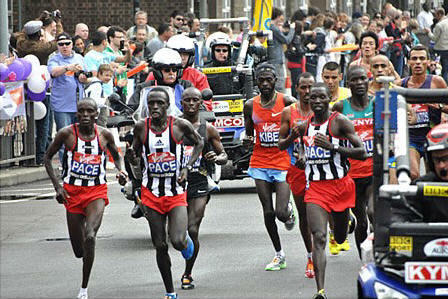 Different to the brave ladies the leading men hide behind the front of pacemakers. Ulf Bosch probably is the one German who did the most Londons. 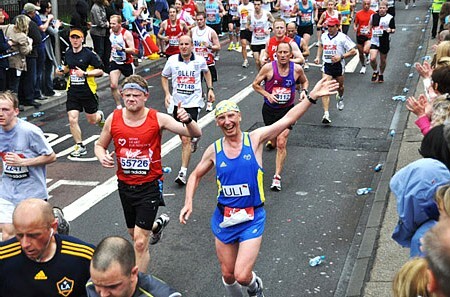 He completed all 14 Floras und today's 1st Virgin is his 15th London Marathon in a row. After 11 miles my legs have shortened but arms are longer. saying that I haven't missed a London during present milliennium. 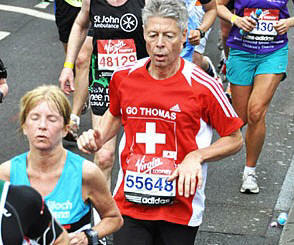 Thomas Wessinghage of Germany, European 5000m champion in 1982, is still running at age group 55+ and completes his 7th London. Jean Paul De Lacy set an unexpected and unbelievable record as he finished carrying his 22 ft tall giraffe. Despite obvious problems passing bridges and tunnels he made it to the finish after 5:55 hrs and had to bend down deeply to get through the final gate. 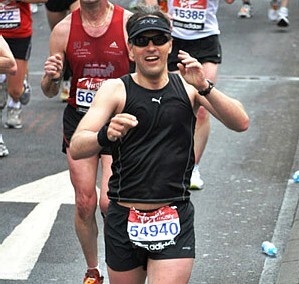 Quote: "I wanted to give up after the second mile, but I remembered my friend promised me a pint if I finished!" achieved an astonishing time of 5:13 hrs. 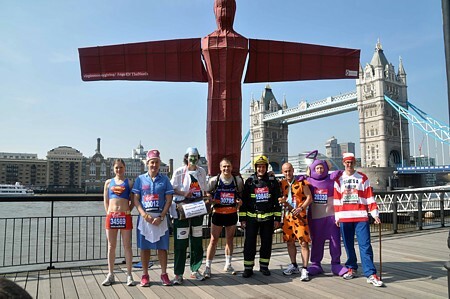 Within the group ran Sam and Holly Branson, children of Virgin founder Richard Branson, and the very first member of the Royal Family completing a marathon: Princess Beatrice. Her performance inspired her mother, Duchess of York, to announce immediately that she will take part herself next year. Empathy with the sponsored event can't be bigger! 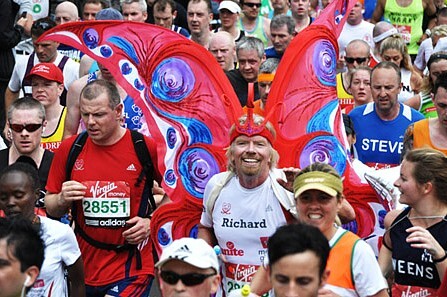 Sir Richard Branson, founder and owner of the Virgin Group, runs his first marathon at the age of 59 Jahren, "helped" by butterly wings, in respectable 5:02:24 hrs. 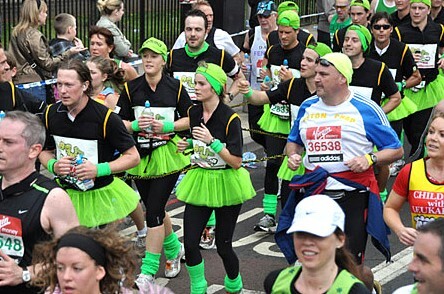 The pair of ostriches is just one example of countless costumes worn along the route. These wings did help less: Flight time was 5:41 hrs. Haile Gebreselassie, based on average of his recent 3 marathons! 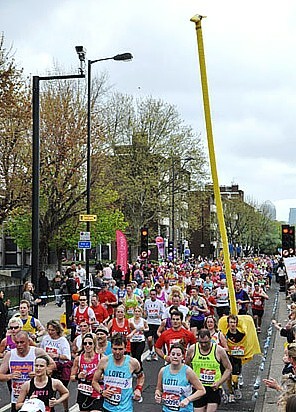 previously disregarded 3rd in London, now is the world's best female marathon runner, holding victories in Chicago and in London by season's fastest time.